I’m cranky. I blame the heat. And I’m sick and tired of people lying. Last week it was Anthony Weiner. While I certainly don’t condone his irresponsible and icky behavior, everybody does stupid stuff they later regret. What I took great issue with was not only his denial, but his vehement denial; calling representatives from all the major networks into his office and claiming he was a victim of a Twitter hacker. That lasted until the other pictures surfaced. Only then did he call a press conference with his tearful apology. 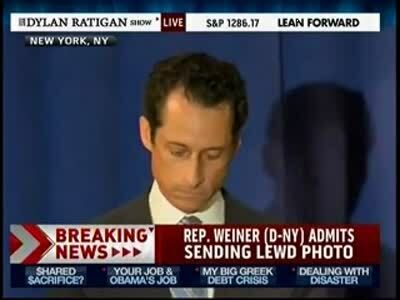 I’m pretty sure Representative Weiner is sorry. Sorry he got caught. Lame apology. Am I upset that they intentionally took “Under God” out of the piece? Yeah, it upsets me. But it certainly doesn’t surprise me. It’s pretty much par for the course these days. It matters not that those words are actually part of the official pledge. Someone on staff at NBC took it upon themselves to intentionally omit those words and the powers that be at NBC thought they could slide it by viewers without taking much heat for it. It was a bad miscalculation on their part. They apologized because the outrage was such that they had to cover their asses, but I don’t think anyone mistook the apology as sincere. I actually think it was worded so as to come across as insincere. 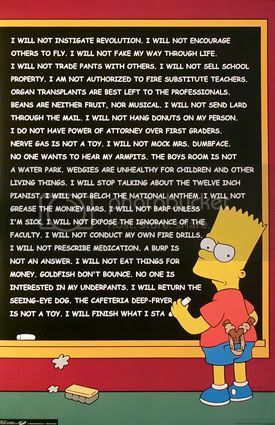 It sounded like something Bart Simpson would write on the blackboard at the beginning of The Simpsons. Spare me and everyone else the lame apologies NBC. If you don’t believe in God or do believe in Him and hate him, or encourage free speech but only when it fits your political leanings, then fine. Do that. Knock yourself out. But don’t try to play both sides of the fence. Nobody’s buying it, and I for one am tired of being treated like I don’t know any better. And I’ll let you in on a little secret: People aren’t as stupid and ignorant as you think they are.